Crowding Out Or Bailing Out? Let us return to our discussion on the “crowding out effect” proposed by economists as the key concern faced by the economy. This ‘’effect’’ and its explanation however, doesn’t provide us even a clue why for instance a lowest grade services sector worker, garbage collectors, cleaners, janitors, waiters, security guards, sales girls at super markets etc and even the moderate workers such as nurses, sales and marketing agents are paid a real wage that is several dozen times lower than a similar worker in an advanced capitalist economy, despite their productivity level and the type of work performed being absolutely identical. How the garbage collector in Sri Lanka goes about his business and the amount of garbage he collects in a given time is equal to one in the U.S. However, there is a shocking disparity in their real wages. This applies to all services sector employments in general. It is on the other hand possible to state that the real wage of a tea leaves plucker in Japan is a great deal higher than one in Sri Lanka while at the same time plantations in Japan earn a mass of profit that is even higher, is stemming from the industrial transformation of this process which replace labour with capital in depth. It leads to higher productivity of labour hence raising the wages by enormous proportions. While Sri Lanka’s planters are committed to perform the task with workers using bare hands for now over two centuries, bringing into being the current wretched plight of the workers. What does this naked backwardness of investments and hence that of the capitalist class in Sri Lanka has to do with its government crowding out the private sector? The heart of the economy therefore lies within her structure, which in Sri Lanka is shaped by the technologically regressive character of investments. Our following discussion however, does not deal with the technological backwardness and hence the nonindustrial character of the economy. Now that it defines Sri Lanka’s economic structure, we seek to reveal a set of inner processes so to speak that nurture as a result, within the ebb and flow of total money capital between private and public domains of the economy. To prune down its scope we will be focussing only on those processes which raise income inequality between capital and labour to fresh heights. These processes at work despite their decisive involvement in the impoverishment of the masses and the enrichment of a class of capitalists, go seemingly unnoticed on one hand due to their materialization being dependent on multitude of interrelating spheres and on the other because they operate within a phase of the trade cycle in which quantitative content of productive capital run through a stagnation. In this light we attempt to show that these processes as we shall call them achieve a tremendous shift of incomes towards capital at the expense of labour during periods where the value of money capital increases relative to that of productive capital and hence obstructs the transformation of the former into latter. Therefore the processes at work which we will be shortly alluding to remain active so long as the phase of the trade cycle we draw attention to remains active. In this light the current developments in the banking and monetary system of the economy are reviewed in connection with the corresponding involuntary movements in the fiscal apparatus to illustrate how within current market governance of everything, income distribution between capital and labour is forced to shift towards the former when quantitative content of productive capital and marginal capital efficiency shrink hand in hand periodically. In this pursuit we will also show the hair rising absurdity in the neoclassical idea of ‘’crowding out effect’’ held in high esteem by our economists and show that current government borrowings and spending is creating a ‘’bailing out effect’’ on capital rather than crowding it out and is doing so prima facie by transferring incomes of labour into the abyss of stagnating capital. At the outset let us get the facts right. The Banking sector expanded nearly 17% in 2013 comprehensively outpacing the nominal growth of country’s GDP (14.5%) during the year. This in turn raised the total asset base of the sector to approximately LKR six trillion (i.e., over 71% of 2013 national income) at the end of the year. A significant trend can be traced in this which characterises the structural performance of the sector during the period, which is a reflection of the general economic processes that are at work we attempt to explain. 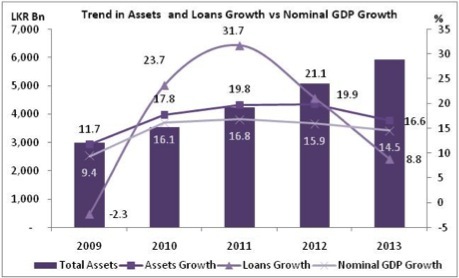 It can be observed that growth in total assets (16.6% YoY) of the sector outpaced the growth in total loans and advances (8.8% YoY) in 2013 which continues well into 2014. Assets growth continued unreservedly despite the setback in private lending activities during the year and as at April 2014 credit growth to private sector has shrunk to as low as 4.1% from 21.1% in 2012 while assets growth remains higher at 11.3%. The growth in banking assets in the face of shrinking private sector loans growth stems from the shift in allocation of banking sector loanable funds from private lending towards instrumental government borrowing in the form of treasury securities (considered as investments in banking terminology), similar to what took place in 2009. The reverse trend i.e., expansion of loans and advances to the private sector at a higher rate than total banking assets, is seen during the following two years (2010 – 2011) when private sector activity grew at break neck speeds (see the graph below). This is to say that the banks are currently lending to the government at will while the private sector is refusing to absorb the loanable capital in the system, indicating the difficulty in transforming money capital into its productive form and hence, relative increase of the value of the former against the latter. This recurring trend should be viewed as an in-built automated act in search of equilibrium within the market mechanism rather than a conscious effort of a particular political or economic entity such as the government. The relative flow of money capital between public and private domains of the economy is an automated one under the market rule of everything under the sun and beyond. It is so given that higher private sector growth and hence higher marginal capital efficiency leads invariably to lower pace of public debt expansion. This is so as it by design leads to higher tax revenue generation and hence reduces the scarcity of funds available in the public sphere freeing the latter from having to resort on increased borrowings. The reverse remains true when private investments lose steam over falling marginal capital efficiency, i.e., public borrowings tend to increase in the face of dwindling tax revenue caused by moderation in private investments. This is to further state that rate of public debt expansion is in inverse proportion to the rate of growth of private investments and latter’s nature of impact on productivity of labour. We may briefly touch upon the latter point on labour productivity as it demands a different form of analysis. Nevertheless, as a matter of clarification it should be stated that the remarkably backward character of the capitalist class in underdeveloped economies in the lights of Sri Lanka stamped by investments into tea, rubber, mining, garments, tourism, imports trade, banks & finance, equity, BPOs, luxury apartments, construction, software products that are not pursued by advanced economies, etc., is at the heart of the prevailing general stagnation in private investments hand in hand with the despicable level of wages and living conditions of the mass of the work force, to which we have drawn our attention in detail in our earlier discussions. The absence of technological dynamism in investments generates its own limits of expansion as it on one hand depresses the growth in wages and hence aggregate consumer demand or the home market. On the other it is further limited by its own narrow range and its incapability to self expand which was explained in detail in our previous accounts. We can hence state that low level of labour productivity realised by backward investments coupled with the limits to its self expansion, in turn leads to increased indebtedness of the public sphere in the long run as the generic character of private investments itself becomes its own fetter for expansion. This can be held as true in relation to the concept of automation in relative flow of loanable capital between public and private spheres under the free interaction of market forces, which we observed with the use of banking sector developments during the past five years. It is remarked in Volume III of Marx’s Capital, “The independent and predominant development of merchant’s capital”, to which we shall include all other backward forms of capital mentioned above, “is tantamount to the non-subjection of production to capital, and hence the capital developing on the basis of an alien mode of production which is also independent of it. The independent development of merchant’s capital, therefore, stands in inverse proportion to the general economic development of society.” This also goes without saying that its opposite form leads invariably towards social development. Of course the thin layer of managerial class and the professional folk, the middle men between capital and labour in addition to being ideological priests of underdevelopment remain devoted to its reproduction as they believe their semi luxury/luxury sustenance gained by doing so is an achievement worth lifelong worship and adulation. They glorify the same mode of production and personify its backwardness that demands destruction and replacement by an advanced social formation. The continuation of this “alien production mode” leads to the inevitable relative impoverishment of the masses as opposed to the development of capitalism proper, of which heart and soul lies with the application of scientific inquiry to the accumulation process characterised by modern indutrialisation (The decadence of advanced capitalism in the West with its inevitable yet contingent turn towards financialisation and services in general lies outside the scope of our inquiry. Further the political strategy that should be adopted by the progressive forces in the region which also falls outside our scope is entirely different from the acceptable approach within underdeveloped regions, which we believe should be self evident). The impoverishment of the mass of the population while the enrichment of a few in Sri Lanka is well-defined by the average per capita household income of 11,932 rupees a month at the end of 2013. Comparison of this figure with Lorenze curve data provides approximately 5,983 rupees as the average monthly income attributable to the lowest 70% of the population, which is nearly 200 rupees a day. This is so given that 70% of the masses at the bottom of the income ladder receive 35.4% of the national income according to the 2012 Lorenze curve figures published by the Department of Census and Statistics. Further, the share of income received by the same group in urban areas was as low as 24.1% in 2010 excluding Mannar, Killinochchi and Mulativu districts. It is important to note that the per capita household income is different from that of per capita income of income receivers. The former provides the average income that is attributable to both income earners and non income earners of the economy. Hence a person who’s receiving 12,000 rupees monthly salary and is supporting the survival of a non income receiver would mean the per capita income attributable to him is 6,000 rupees. The latter should be considered as his actual income and not the 12,000 he receives on a monthly basis. In terms of nutritional level 40% of the women and children and 50% of pregnant women in Sri Lanka according to UNICEF is affected by anemia, while economic growth rate over the past few years has been beating rest of the world except that of probably China. High economic growth hand in hand with scandalously low living conditions of the mass of the population show cast the concentration of incomes among a backward class of capitalists at the demise of majority of the masses. Hence the mode of production embraced by underdeveloped societies is providing the victuals to feed alienation of the masses. The cultural gulf between upper classes and the public in Sri Lanka is many more times deeper and antagonistic than what’s found in advanced capitalist societies. This is to say that the force of alienation flourishes and earns its extreme state within underdeveloped regions and its prevalence remains less pervasive under advanced capitalism. Assuming that the stats of this Guru is the real thing, LKR 12.000 a month per household is not as bad as the 500 plus Million on Modi’s Turf who , are only on less than a Dollar a day. And that is the Model that we are supposed or are being forced to follow. Even Mao couldn’t make the poor become rich. Perhaps Harsha de Silva can join hands with Somawansa protege to give it a try with this Economist as the chief adviser. Kotelawallas crowded out a lot of their Elite mates of their life savings with the Golden Key business. Just imagine how many more Kotalawallas are waiting in the wings until Dr Harsha de Silva brings them on to look after the inhabitants. But the great majority , in fact 70 percent of the population who are apparently just on LKR 12,000 month only worry about whether Dr Harsh and his mates like Ravi Karunanyaka will sell their new roads, sea and air ports to overseas Whites at mates rates. 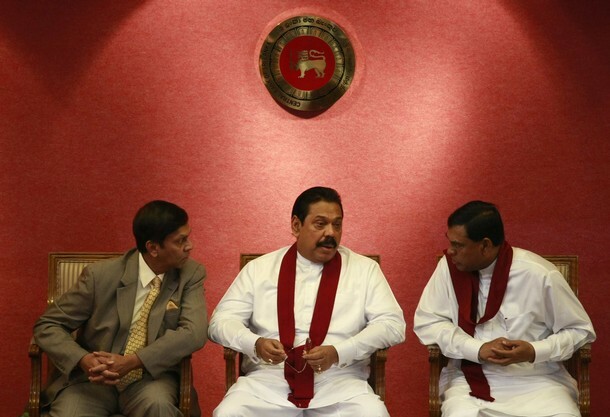 BTW, The anti Srilanka, anti Sinhala and anti Buddhist brigades here are not interested in Pathiran’s Econmic lessons. Perhaps Mr Pathrana should write something on how the Pillai Police will give us a growth rate to catch up with the Germans, in his next episode….